This cover is best for intense sun environments. 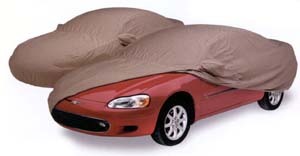 This is a cover that is made to fit your exact make and model of your vehicle. The fabric to use in intense sun environments, Sunbrella fabric from Glen Raven Mills has long been recognized as the choice for marine covers, sail covers, and deck enclosures. Softened for automotive use, Sunbrella is designed to block damaging UV from reaching the vehicle's exterior and interior. If protection from intense sun exposure is what you need, this is the fabric. Acrylic fibers suffer minimal loss of strength from exposure to heat, moisture and UV. Colors are a result of using pigments that are actually built into the fibers instead of dyeing the surface of the finished fabric. The fabric is treated for moisture resistance, but it's breathable to prevent heat build-up under the cover. Acrylic fibers resist growth that can occur in moist situations.